Two Navy reservists practice folding a flag shortly before a veteran's funeral at the Missouri Veterans Cemetery in Springfield. This morning in our Sense of Community series on "Opportunities for Veterans," we’re featuring a visit to a cemetery to learn about the funeral choices for veterans and their families. Hugh Myers is the director of the Missouri Veterans Cemetery of Springfield. 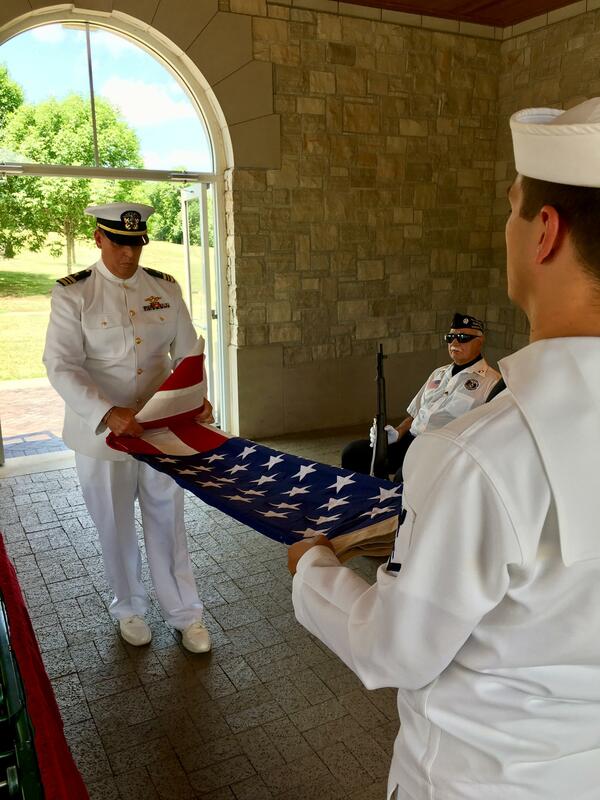 On Wednesday when we met him for a tour, he was preparing for the funeral of a Navy veteran. "With the earth burial and our cremation that’s in the columbarium, we are just at 10,070 burials here at the cemetery,” Myers says as he drives through the property. This cemetery, and four others across the state, were established in the late '90s, Myers said, when state officials discoverd the national cemetery was going to be completely full. “We have a form for the veteran to fill out. And we also need a copy of the veteran's discharge papers, his DD-214. And in addition to that, if there is a spouse to be buried with the veteran, then we need a copy of their marriage license," Myers said. Even if the spouse passes away first, Myers said, the couple can still be buried together here. The Honor Guard members take their places shortly before the funeral procession arrives at the cemetery. The service is provided free to all military veterans, and can be requested through any funeral home. And veterans don't have to wait until death comes knocking to submit this paperwork, he said; many families submit the paperwork early, as soon as they have decided they want to be laid to rest here. Myers pulls up at a small, stone building to prepare for Wednesday’s service. The wind rattles the flags, one for each branch of service. Two Navy servicemen are already there in uniform, preparing to fold the American flag. The Honor Guard volunteers are arriving, as well. They will fire three volleys and play TAPS. A veterans group of motorcycle riders, the Freedom Guard, arrives in front of the funeral hearse and casket. The Honor Guard stands at attention, rifles in hand. George Morley, who is calling the Honor Guard today, says many families don't realize this is a free service to all military veterans. The surviving family members just need to request the Honor Guard through the funeral home they are working with. Myers tells the small audience there will be three volleys of fire when the Honor Guard fires on command. 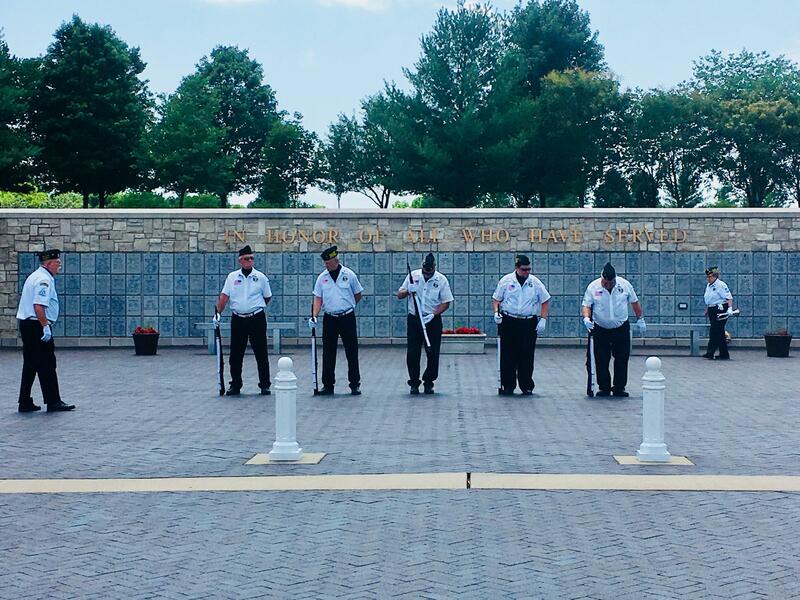 At the time of taps, all veterans render a salute. Then, after taps, the Navy reservists fold a flag. The surviving spouse is sitting on the front row. The Veterans Cemetery is located at 5201 S. Southwood Rd. in Springfield, Missouri. The phone number is 417-823-3944. Myers says the easiest way to reach the cemetery, coming from Springfield, is to take Highway 65 South, then take the Evans Road exit and follow the signs to the cemetery.